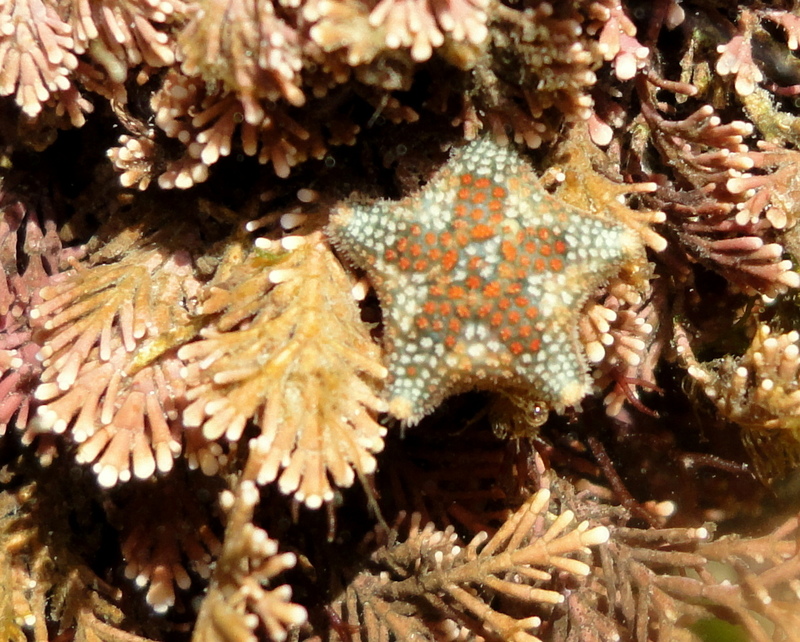 Even after all these years of exploring the Cornish rock pools, I find something new every time I go rock pooling. I’ll add my latest discoveries here and I’d love to hear about yours. The full stories are in my blog. It’s not unusual to find signs of spring in the Cornish rock pools in December, but most people don’t realise that in the sea, animals are already laying eggs and getting set for the warmer months ahead. There was plenty of colour in the rock pools this week for the festive season, with bright anemones shining out of every pool. Although spring is still some months away on land, there are signs that the rock pool creatures are already getting set for the new season. This shore crab was carrying a full load of eggs under her tail, snails were laying their eggs on the seaweed, star ascidian colonies were forming and the Goniodoris nodosa sea slugs were gathering ready to spawn. The days are getting longer and an exciting new year is round the corner. This little sea slug looked so much like another I see often, that I didn’t pay enough attention to it. It was only when I looked at photos from a ‘secret beach‘ that I realised it had strange tubercles on its skin and strange colouring. 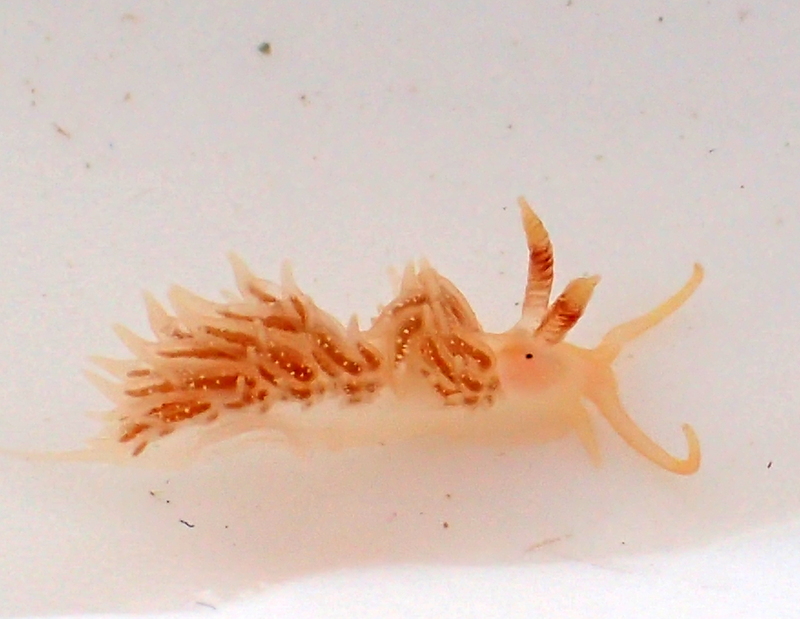 The Doris ocelligera sea slug is new to me and there have only been a handful of records of it in the UK before – but it seems to be having a good year, perhaps due to warming waters. One to look out for! I’ve always wanted to see a Snake pipefish (Entelurus aequoreus), a relative of the seahorses that can grow to almost the length of your arm. During a recent survey at Hannafore beach, Looe, I was lucky enough to spot this one swimming past my foot. It’s easily distinguished from other pipefish by the beautiful pale stripe markings down its sides, which act as the perfect camouflage among seagrass and seaweeds. It’s not always easy to get motivated in the depths of winter when the gales and rain are blowing straight across the shore. I was very glad I did venture out though, because I came across this surprise sea slug (Facelina auriculata) under a rock. It was an incredibly colourful find for the conditions and one of the most beautiful sea slugs I’ve come across so far. Surprisingly, in December there are already some babies around. Tiny juvenile sea hares are chomping their way through the seaweed. By the spring, they will have grown into fat adult sea hares with leopard-spot markings, and they’ll converge en masse to lay their pink-spaghetti eggs on the lower shore. 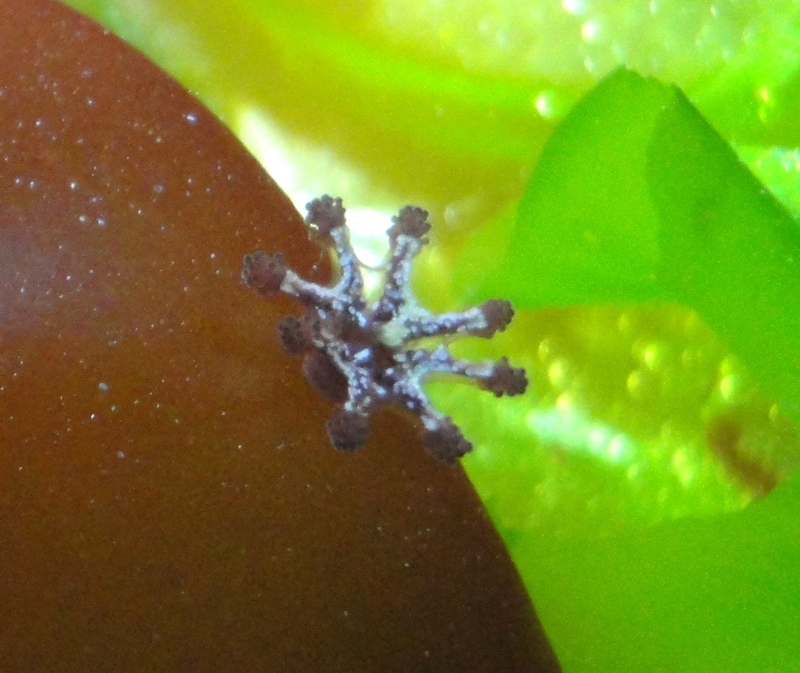 The babies are vivid red with black edges to their parapodial lobes. Once a year, Cornwall Wildlife Trust’s Shoresearch project run a whole week of surveys to gather data about our intertidal wildlife and inspire more people to record their finds. 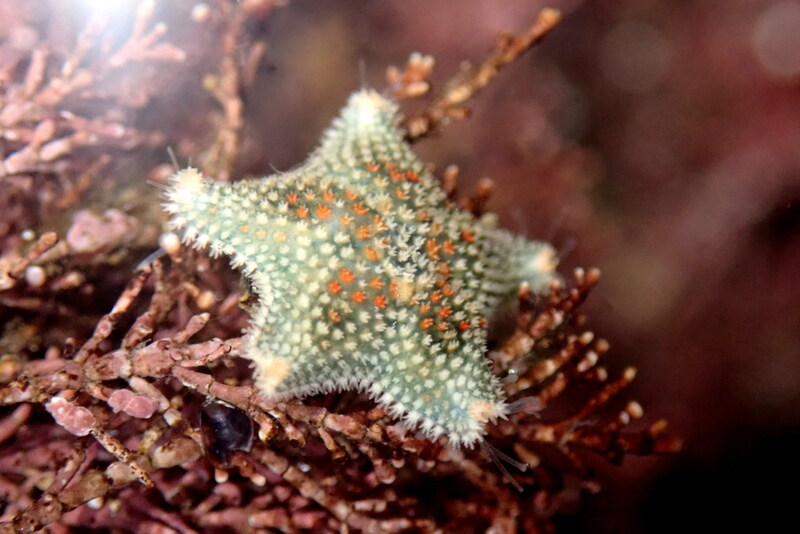 I joined the surveys at Fowey and Looe and was delighted to find this gorgeous little Asterina phylactica starfish at Readymoney in Fowey. 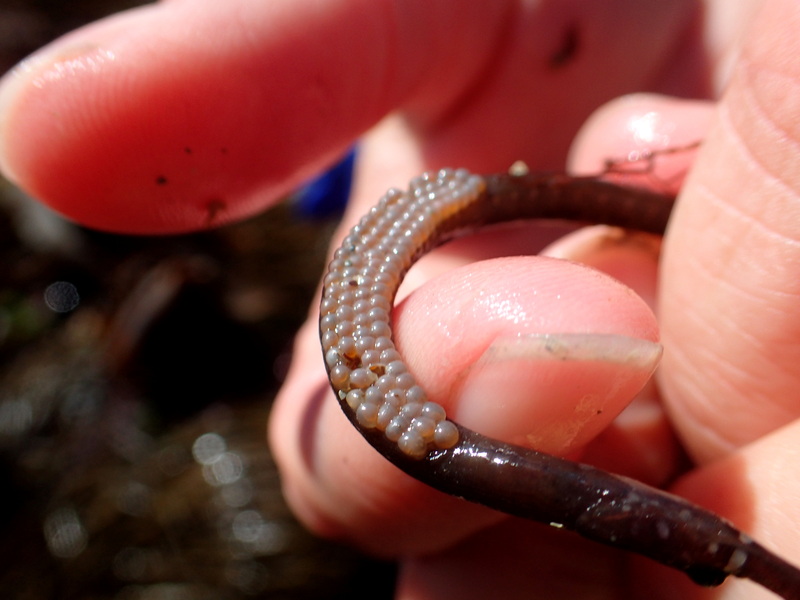 They’re rarely seen as they’re small enough to fit on your fingernail and live hidden among coral weed. This one has the classic pattern of pale and orange dots, forming a rough star shape in the middle. As you can see these dots are actually little pincer-like spines on the starfish’s back (called pedicellariae) which the animal uses to clean itself and stop algae and other organisms growing on it. A double-headed stalked jellyfish (Calvadosia cruxmelitensis) was one of the highlights of the month, along with a Hairy hermit crab (Pagurus cuanensis). We had some great tides at the start of the February half term, aided by an unusual wind direction that pushed the waves away from the shore. My son, Cornish Rockpools Junior had a great time surveying stalked jellyfish at Portwrinkle in the Looe and Whitsand Bay and now holds the ‘world record’ for that location! Our favourite was this pair of Haliclystus octoradiatus stalked jellies – the one on the right of the photo is a tiny juvenile! 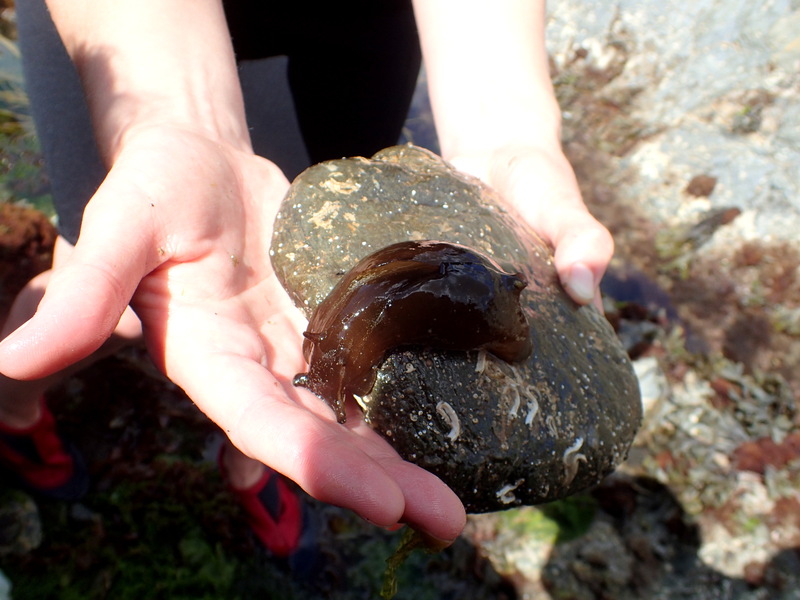 I often get asked to identify ‘strange blobs’ that people have found in the rockpools. 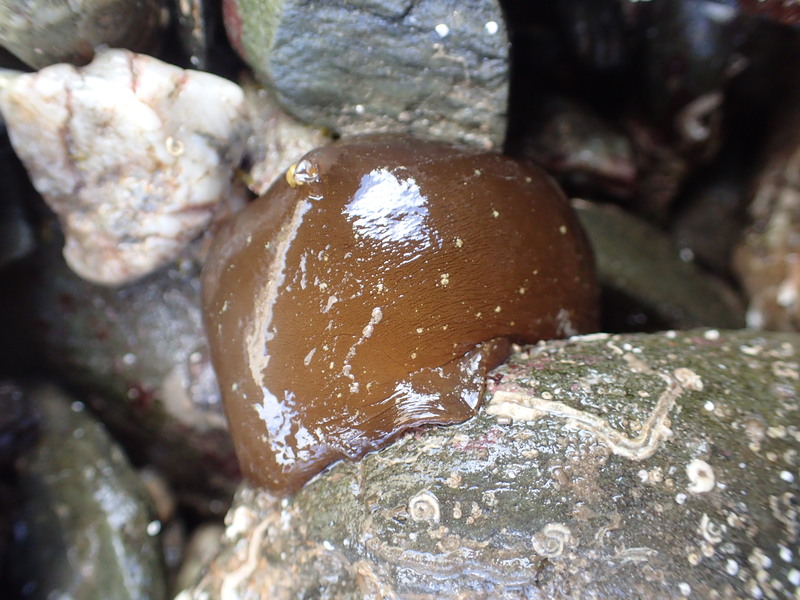 While exploring at Port Nadler near Looe, I came across one of my favourite ‘blobs’, a Lamellaria perspicua. I have a bit of a block with them – whenever I find one I start by thinking it’s a sea slug, maybe a juvenile sea lemon by the colour. In fact, the Lamellaria perspicua has a shell, like other snails, but it’s completely hidden. Just before Christmas I had an amazing week for finding stalked jellyfish. Over a few days, including a survey with Natural England on Friday, I recorded 48 stalked jellies on the beaches around Looe in South East Cornwall. All three species are tiny and well-camouflaged among the seaweed, but well-worth the effort of searching for. Huge thanks go to Ben and Annabelle Lowe for sending in this wonderful photo of a Sponge crab that Ben brought in on a crab pot near Newquay. These amazing and rarely-seen crabs grow a living sponge on their shell. The crab benefits from camouflage and the sponge has a great surface to live on, which moves around taking it to the best food. Sponge crab. Found on a lobster pot near Newquay. Photo by Ben Lowe. I sometimes see adult Greater pipefish in the pools, but when I found these minuscule thread-like fish among the kelp at Port Nadler Bay, it took me a while to realise what I was looking at. These baby pipefish were so newly-hatched that they still had their yolk sacs attached. Like their relations, the sea-horses, it’s the male that carries and hatches the eggs from his brood-pouch. The proud parent of these little babies was probably still somewhere nearby. I’m delighted that Cornish Rock Pools has been named ‘Blogger of the Week’ by the BBC Wildlife Magazine for my report on finding and photographing these gorgeous Scarlet and gold cup corals this week. Read more here. These beautiful little corals are normally only seen by divers, but can be found on exposed rocky shores at the lowest tides. They grow under steep overhangs and in the areas of high current and wave exposure so they are often tricky to access. In some places these anemones are fairly common, but I don’t often see them at Hannafore, so this Sagartia troglodytes caught my eye. They’re a small species with intricate patterns. Their column is sticky and often has fragments of sand stuck to it – this one is covered in tiny shells. It’s amazing how much wildlife has survived the winter storms. Even small and seemingly delicate creatures are thriving – like this Anapagurus hyndmanni hermit crab. Pipefish are related to seahorses, but instead of a pouch to carry the eggs, the male pipefish has a special groove along his belly where he looks after his partner’s brood until they hatch. It’s always amazing to see, but I was surprised to see a ‘pregnant’ male so late in the season – it was 30 September when I found this one. He also had a particularly large clutch of eggs. It’s important to keep pipefish couples together so I returned this one to its rock pool straight away. 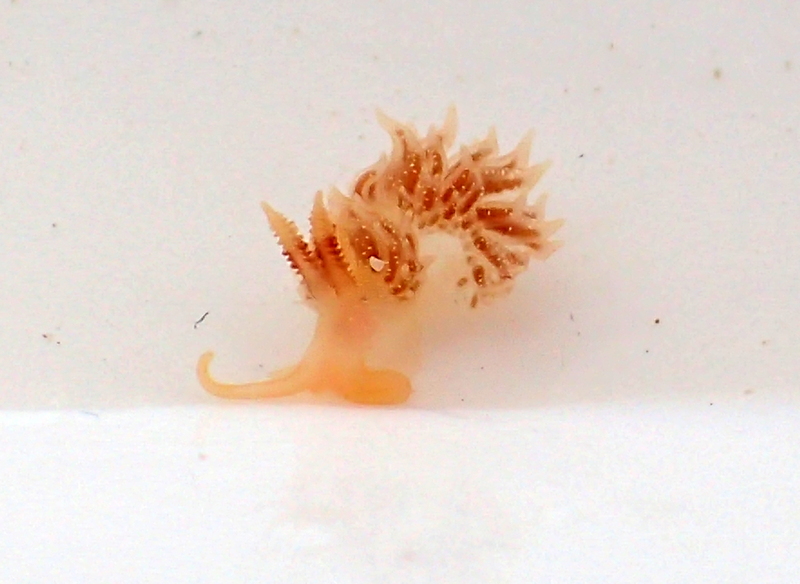 Another new sea slug, Facelina annulicornis, turned up this month – it’s always great to find something so unusual that I need to turn to the experts to confirm identity. 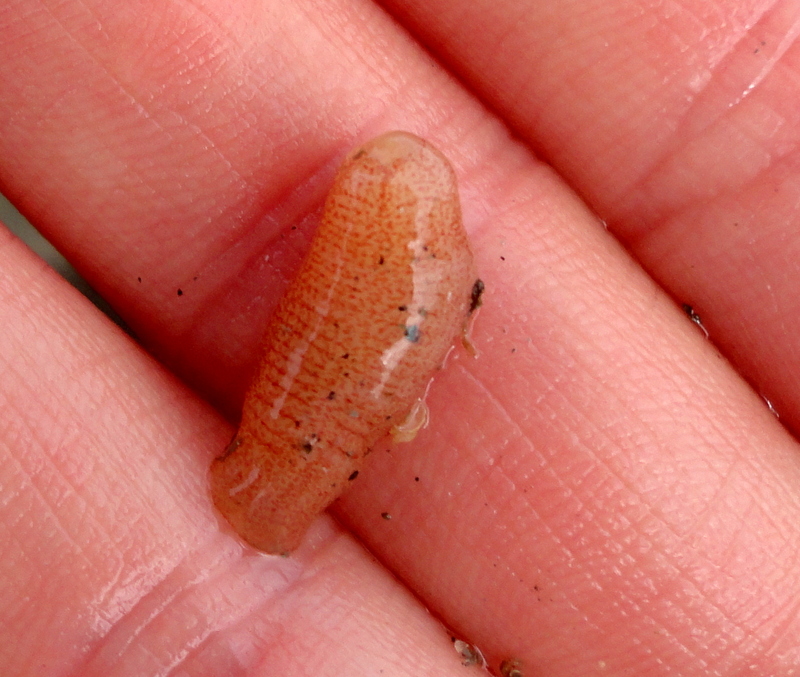 This slug was so tiny that I thought it was just another amphipod (sand-hopper) at first. When I put it in water these beautiful features unfolded. The rhinophores (the antennae-like tentacles on its head) are beautifully ringed, which is where the name ‘annulicornis’ comes from. Facelina coronata with its front tentacles drooping like a lion-tamer’s moustache. It’s the first time I’ve see this species. This is just a juvenile – they can apparently grow to 30-40cm long. Unlike other species they can sucker onto rocks – this one looked like an anemone when I first found it. 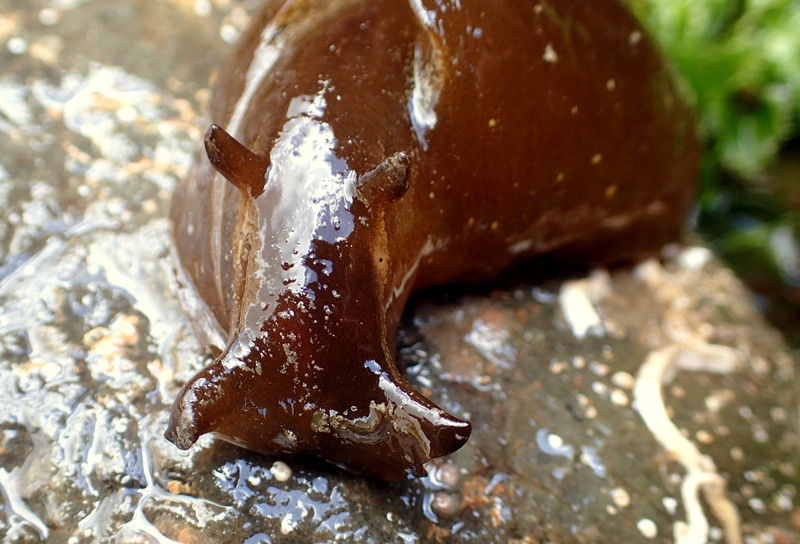 What I loved the most is the slug’s face, which reminded me of a hippo. Is it just me? If I looked away for a second, it was almost impossible to spot this stalked jellyfish again. This Lucernariopsis cruxmelitensis was only a centimetre or two across. I often travel to beaches where I know I’m likely to see some of my favourite creatures or discover new ones. It turns out that my local beach, a short walk away, has some species I love and never knew were there. 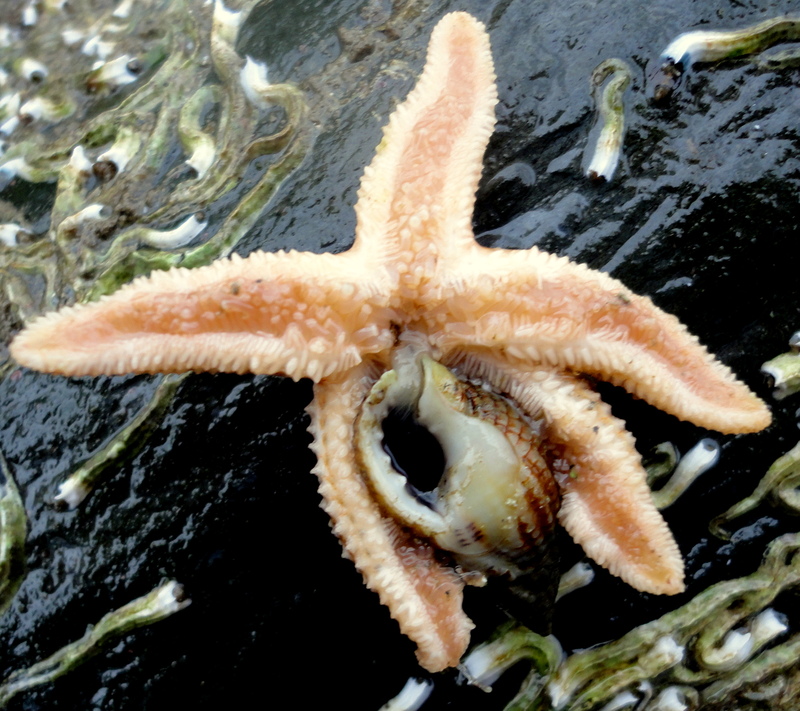 Common starfish eating a netted dog whelk. I’ve read about the way starfish eat by raising themselves above their prey and extruding their stomachs to engulf their meal. This month I’ve come across several starfish on the shore enjoying a meal. Amazing to watch. 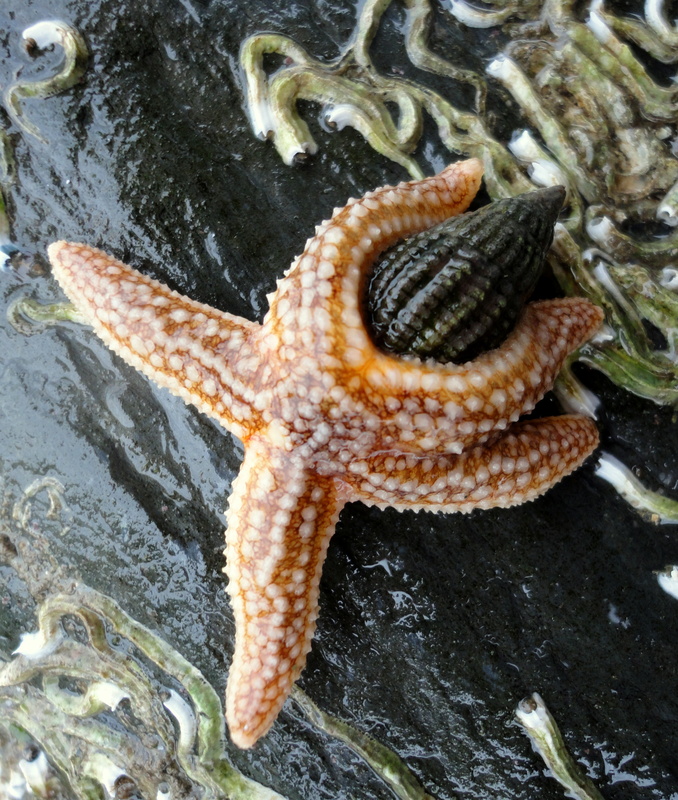 Underside of a common starfish as it tucks in to a netted dog whelk. This worm-like creature had me baffled. 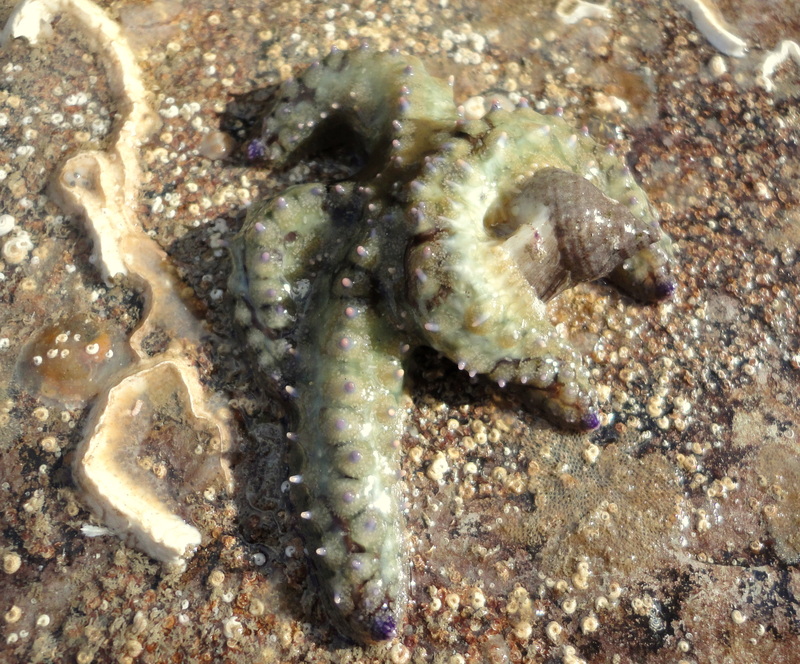 Thanks to some help from the experts I discovered it is, in fact a type of sea cucumber – or at least part of one. It’s either a Leptosynapta inhaerens or Labidoplax digitata. Sea cucumbers are relatives of the starfish and sea urchins and most have tube feet a bit like the starfish – but this species doesn’t. It grows much longer than this, but when it is disturbed it can break into lots of small sections, each of which can regenerate into a new animal. It just goes to show there’s always something new on the shore.